With white sand shores, palm trees, and breathtaking sunrises, plus ice-cold beer and stone-baked pizza, the Last Point offers its own taste of island paradise. Endless beaches, lush jungle, a vibrant and sociable bar, happy hours and drinks offers throughout the day, and some of the cheapest accommodation on the island make this the go-to spot for the budget-minded and fun-loving. You could be here: Last Point beach. Located in a secluded bay on the sunrise side of the island, Last Point is perfect for people who want to get off the grid but still enjoy the fun of partying with fellow castaways. Sit at the big oval bar and join those who are playing cards, eating pizza, and doing shots. But when you’ve had enough socializing, there are plenty of hammocks where you can kick back, read a book, and soak up rays in peaceful solitude. 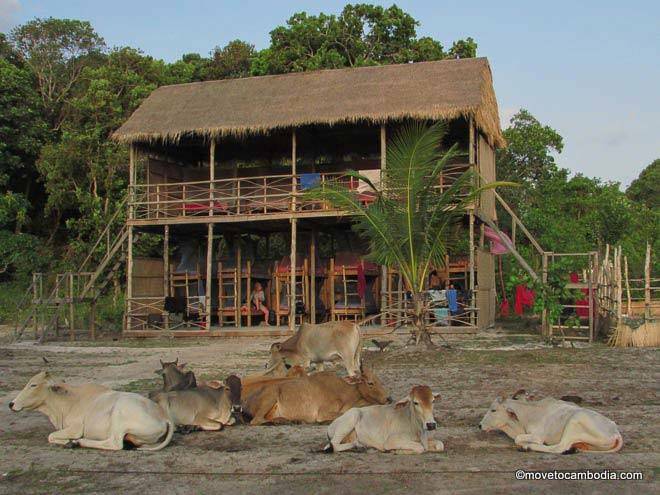 The Last Point dorm offers the chance to appreciate Cambodian island life at its finest. 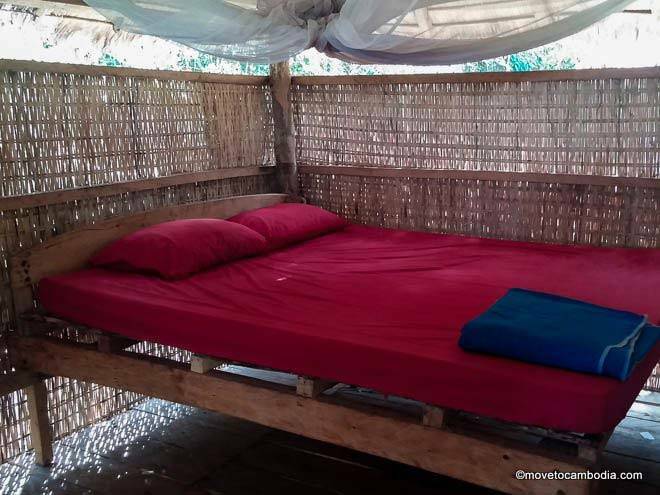 The open-fronted wooden dorm is favored by solo travelers and couples alike, but a handful of rustic wooden bungalows next to the beach or set back in the jungle will appeal to those who fancy something more private, peaceful, or romantic. Adventurers can rent a hammock or bring their own tent and set up camp on the beach. Last Point is also the only resort on the island to offer actual showers, where water comes out of a shower head rather than a bucket you have to scoop over your head. Granted, the water is a bit murky and the water pressure leaves a lot to be desired. But if taking a shower tops your list of things you want to do on a desert island, this could be the spot for you. 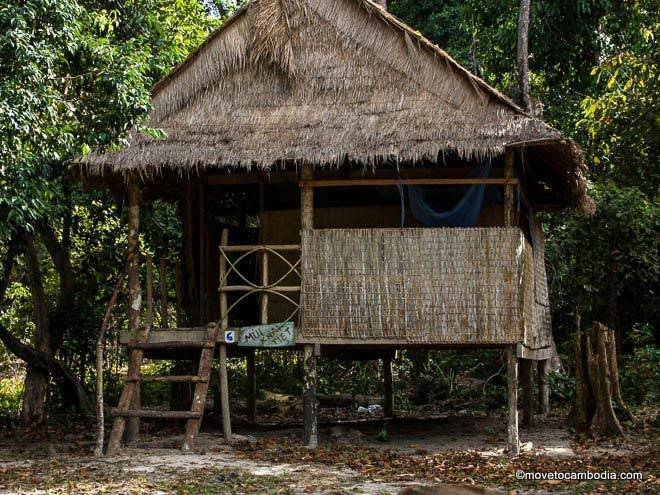 A private bungalow with one of Koh Ta Kiev’s only proper showers! Last Point offers plenty of other activities as well. Explore the beaches, play volleyball under the sun, snorkel over the reef, take a walk to the nearby fishing village, or take a sunset boat trip to the other side of the island for beautiful views, cheap beers, and a spot of cliff jumping. Then there’s the drinking. Last Point boasts both morning and evening happy hours, plus, for those who enjoy a challenge, the Klang-30. Every day from 3 until 3:30 p.m., anyone who buys one icy can of Klang is invited to drink as many more as they want for free. If drinking isn’t so much your thing, you can concentrate on the food, which includes bread and pizzas freshly made in Last Point’s wood-fired oven. An array of Western and Khmer dishes are also offered, starting from $4. The kitchen is open from 7 a.m. until 9 p.m., with pizzas available after 12 noon. The bar is open from 7 a.m. until the last guests head off to bed, and you can still get potato chips, Snickers bars, and similar snacks even after the kitchen has closed. Inside one of Last Point’s bungalows…rustic but clean! Getting to Last Point is easy. Just show up at 11:30 a.m. at Seagarden on Otres 1 and get on the boat there. If you want to stay in a bungalow we highly recommend booking in advance, as they fill up very quickly. Otherwise, bring your own tent and hammock or kip in one of the comfy beds in the dorm. The boat costs $12 return and takes about an hour and a half, so wear sunscreen and bring plenty of water, especially on hot days. During the rainy season the boats will run from Ream National Park rather than Otres; transport is provided. If the weather is bad and the boat is unable to get into the bay then you may have to walk through the jungle to the fishing village and hop on the boat there, so be sure to pack accordingly. 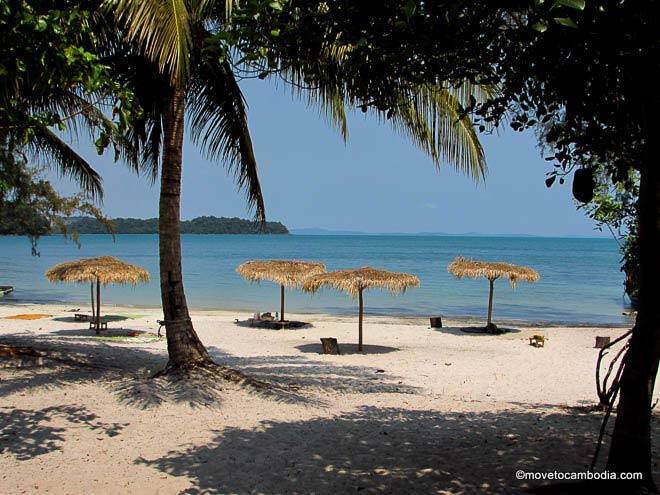 Make a booking at Last Point now, or look for other accommodation on Koh Ta Kiev.